Custom double wide panel being laid out by Rey Maranan (Shop Foreman). Photo by Riverwood Photography. Industrial equipment supplier Dragon HPCS was born out of necessity. In 2014 when the oil prices plummeted, companies had to find ways to cut costs without cutting corners. Companies across the sector were faced with the task of slashing their prices in order to attract and retain clients. 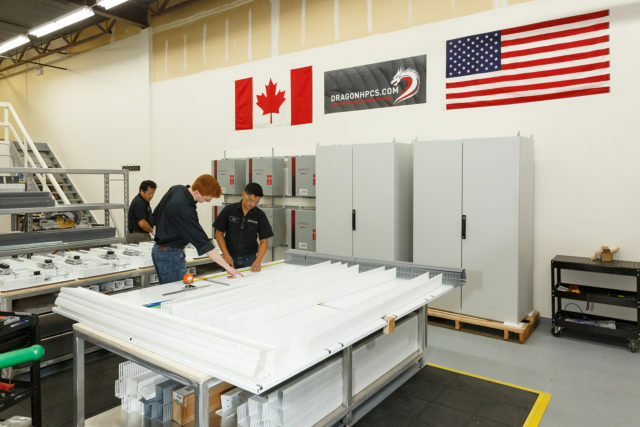 The concept of pre-engineered products was developed over the next few years and in 2017, Dragon established a single panel shop to produce standardized products. 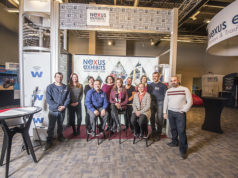 It partnered with the best in the business as part of Rockwell Automation’s single-source vendor OEM program with stock provided by distributor Westburne Canada. In a short time, word spread about Dragon’s product lines and the small shop expanded its client base to include a variety of large and small oil and gas companies. Dragon has earned a reputation for high quality and service for all of its products. It has automation solutions for every industry segment with its control panels (CP Series), junction boxes (Smart JB Series), lighting and motor units (LM series) and rotating equipment (RE Series). The LM Series is used for automating building lighting and exhaust fans and can easily be integrated with the CP Series control panel, while the RE Series is ideal for rotating equipment for small, medium, and large horse power applications or panel retrofits. The CP Series, ideal for supporting oil batteries, storage compressor stations, and processing facilities, can maintain up to 300 IO standalone and up to 10,000 IO when used with other CPs and Smart JBs. The Smart JB Series, designed for process building IO terminations and remote IO panel and junction box replacements, enables users to connect more than 100 boxes with a single controller. Typical systems have a hundred wires running back to the main building, but Dragon’s innovative design runs wires into the ethernet adaptor and connects to the processor using one ethernet cord. “These can be pre-configured and you can do the testing in the building. Then it goes out to site and you run one ethernet cable. No field testing needed,” says Van Tighem. This innovation saves clients money, not only on engineering costs because the system is pre-fabricated, but also on the cost and time to have electricians pulling wires on site and testing the connections for each box. “Everything has its place in the market and at a certain point with an IO density, the Smart JBs are very competitive and on the mark, and will save in wiring and equipment costs in the field,” says Dragon client Scott Barraclough, project manager for Tri Alta Projects Inc.
Dragon’s products eliminate redundancy in the field and give clients peace of mind knowing the system will perform well. “We’re confident enough, seeing as this is a battery, that we even hardwired our ESDs back to the CP panel. We were confident that the network was robust enough to handle that,” Barraclough says. Clients appreciate the quality and recognize the value of buying from Dragon. Using standardized designs saves clients around 40 per cent, and Dragon saves companies even more by always having parts in stock. Units can ship to clients in about a week instead of the eight-week lead time of custom panel shops, so clients are up and running faster. Also, all of Dragon’s products are UL rated and undergo rigorous QA/QC testing before going out. With Van Tighem’s training as an engineering technologist, he is proficient in programming so besides being able to produce AutoCAD drawings and customize products, he can also power up the units to ensure everything functions as it should. Every team member is Rockwell Automation certified and as part of the OEM agreement. Dragon has access to the entire Rockwell Automation toolkit of hardware products and software to ensure the highest quality products possible. The units exceed expectations. As an OEM partner, all of Dragon products are supported by Rockwell Automation, incorporating that company’s gold-standard components into each design. This global manufacturer is proud to partner with Dragon to offer a unique solution for the oil and gas industry. For the past year, Rockwell Automation and Dragon have been engaged in an OEM partner program that involves product branding and joint marketing. This has created new market access that the company has not penetrated in the past. Their partnership with Dragon has proven particularly successful. Dragon’s cost-cutting design and business model, paired with the best components in the industry, gives clients an incredible automation option. Good partnerships are key for success, and Dragon has enjoyed the benefits of aligning with Rockwell Automation and Westburne Canada to grow the company. Westburne helps ensure that Dragon can fulfil its promise of always being in stock; Dragon has two months’ worth of inventory on its shelves and Westburne has another four months’ stock to guarantee the turnaround remains fast. The long-term relationship between Rockwell Automation and Westburne was strong before Dragon was established, and this has helped the panel shop quickly become a contender in the marketplace. In today’s market, where every penny counts and competition is fierce, potential clients are asking questions about whom a company partners with before signing on. They want to ensure all companies involved are reputable, provide quality products, and stand by their work. Dragon’s alliance with Rockwell Automation and Westburne shows clients that the Dragon brand is backed and supported by the best. Dragon HPCS continues to evolve as it moves forward with plans to build onto its product lines with the introduction of standardized MCC sections and pump-off controllers along with smart technologies that allow clients to maximize their connectivity from the palms of their hands. “The solutions Dragon is providing are laying the foundation of that future technology and future innovations in the oil and gas industry,” says Hearn. 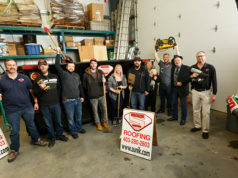 Dragon HPCS is looking forward to a future of expansion, growth, and continued partnerships to serve clients throughout Canada and the United States. 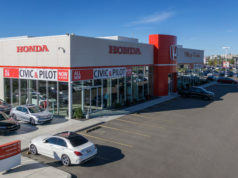 To that end, it has dedicated salesperson Robert Ward based out of Houston promoting the products in the United States, and Rob Forbes out of Calgary representing the company’s interests in Canada. “We want our name to grow bigger and bigger. We want to start dominating the Denver and Houston areas,” says Van Tighem. Dragon is well on its way. On top of its existing products, the next two quarters will see a pump jack controller and standardized power solution added to the panel offerings. With world-class solutions and quality products, Dragon HPCS has blazed a trail in the industry to become a go-to shop for automation.